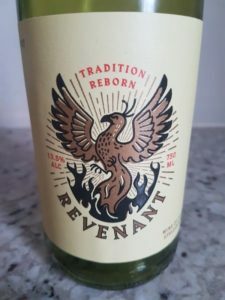 Revenant 2017, produced for False Bay Vineyards at Waterkloof in Stellenbosch, is a blend of 80% Sauvignon Blanc and 20% Chenin Blanc and recalls the first white wine made by owner Paul Boutinot in France back in 1984 which was also composed of these two varieties. Winemaking involved spontaneous fermentation primarily in old barrels and concrete eggs with 10 months of ageing on lees. Pear, citrus and white peach on the nose while the palate shows lovely fruit expression and coated acidity with the Chenin doing a good job of tempering Sauvignon’s “greenness”. Great fun to drink. Price: R95 a bottle.